City Girl, Country Home: What Christmas Rush? OK, I have a confession to make: I am so far from having checked all the names on my Christmas gift list. But for some reason, I feel no pressure. As people were distributing gifts during yesterday’s Christmas party at our Catholic community’s homebase, I was receiving and saying, “Thank you!” Of course, I had prepared gifts for the exchange gift part, but other than that, I wasn’t giving away gifts just yet (OK, there’s still next week…). Part of me kinda wonders why I am not experiencing the proverbial Christmas rush. Maybe the provincial life has caught up on me, that of being laid back, I think to myself. Or maybe I am just deliberately sparing myself from unnecessary stress as I choose to savor the season. What also assures me is that at least (or at best?) I have a birthday gift for Jesus (He’s the first One on my Christmas gift list; after all, it is His birthday we’re celebrating). The rest will follow. For the record, and now that I think of it, I have been quite busy lately — two weekends ago, we had houseguests who stayed with us for three days, and two of those days were spent bringing them around the countryside; the week after, aside from my usual domestic and work-at-home concerns, I held an ukay-ukay (kind of like a garage/yard sale) at home (I do this every so often); that same week, my husband and I organized the Christmas party for our community branch; and the following morning, we packed (mostly my son’s clothes and some toys) for our afternoon flight back to the city. Now that I’m back in the city, I’ve already attended two Christmas parties and I’m also back working in the office. In this busyness, I actually do not feel the rush! And now it dawns on me that for the past four days that I have been in the city, I’m even able to exercise outside every morning and just enjoy talking to God. So there, it is possible to not have the Christmas rush! I guess it’s all in the focus. A friend of mine said that she’s decided to spend time before the Blessed Sacrament each day to free her from all the distractions. Another said that she would concentrate on helping others in need this Christmas. As for me, I’ve determined to seek the Lord even more this season, to recognize God’s surprises (more on that in my next blog post) and to enjoy it as much as I can. When we focus on what really matters during Christmastime, then there really isn’t any room for the rush. Feeling the Christmas rush? Then maybe it’s time for some hush. Ask the Prince of Peace to fill your heart and soul. 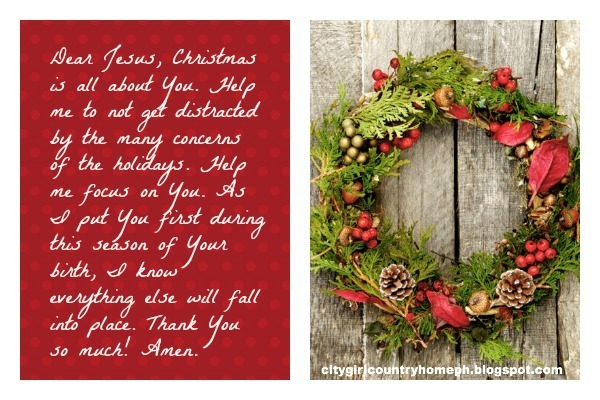 And pray this prayer with me: Dear Jesus, Christmas is all about You. Help me to not get distracted by the many concerns of the holidays. Help me focus on You. As I put You first during this season of Your birth, I know everything else will fall into place. Thank You so much! Amen. Don’t Miss a Thing this Christmas!